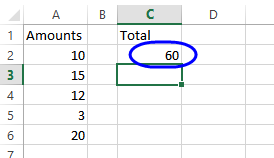 Use formulas in Excel, to calculate results, or simply link to other cells. Simple examples below, and click links for specific functions. 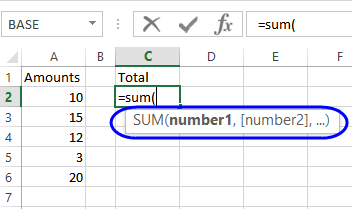 In Excel, you can use formulas to calculate results, such as the sum of a range of cells. Formulas can be short and simple, such as adding two numbers, or long and complex. 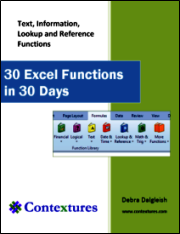 Formulas can include one or more of Excel's built-in functions, and advanced users can even create their own functions. In this tutorial you'll see how to get started, by creating very simple formulas.Once you know the basics, you can explore the many other function articles on this website, by clicking the links in the More Tutorials section. First, we'll create a very simple formula, that adds two numbers. The cell below the formula should be automatically selected, after you press the Enter key. You'll see the formula result -- 3 -- in cell B2. Look in the Formula Bar, just above the column headings. 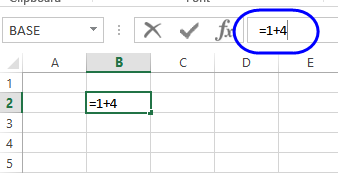 NOTE: If the Formula Bar is not visible, click the View tab on the Ribbon at the top of Excel. Then, add a check mark to Formula Bar. After you create a formula, you might need to revise it. In this example, we'll change it to give the total of 1 and 4. Click in the Formula Bar, just above the column headings. Press Enter, to complete the change. After you type the bracket, Excel will show you the required and optional arguments -- an argument is a piece of information that the function needs. Optional arguments are in square brackets, like [number2] in the screen shot below. The formula result will be displayed in the cell. To see the formula again, select the cell, and look in the formula bar. 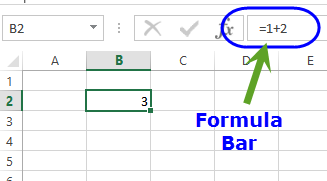 Here are 3 quick tips, for entering a formula in Excel. To start the formula, type an equal sign, and start typing the name of a function. A popup list will appear, showing any functions that match what you've typed. When the function that you want is highlighted, press the Tab key, to enter it in the cell, along with its opening bracket. Before you start typing any of the arguments, press Ctrl+Shift+A to put all the arguments into the cell. The first one is highlighted, so just click on the range that you want to refer to. Then, double-click on the next argument name, and select its range on the worksheet. f that function popup gets in your way, point to it (anywhere except the function name or bold argument name). When the pointer changes to a 4-headed arrow, drag it out of the road. That tip popup is helpful most of the time, but can be a nuisance if you're trying to click on a column heading. 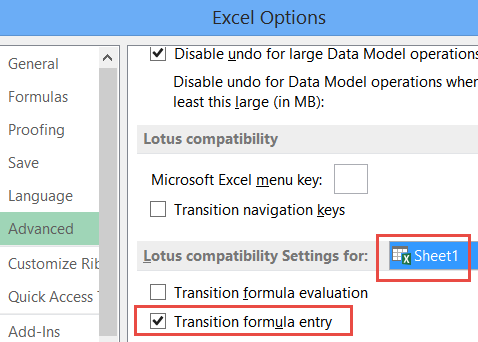 Scroll to the bottom, and in the Lotus Compatibility Settings section, add a check mark to "Transition formula entry". NOTE: This only affects the sheet that is selected in the drop down list. Click here to download the sample file for this tutorial. The file is in xlsx format, and does not contain macros.